Finally, after having to send out flyers to track Mr. Sheldon Butts, I was able to catch up with him at his childhood residence. He graciously gave me a quick tour of the home in which he grew up. The family room is littered with pictures of his brother, two sisters, and him along with the grandchildren of the Butts family. 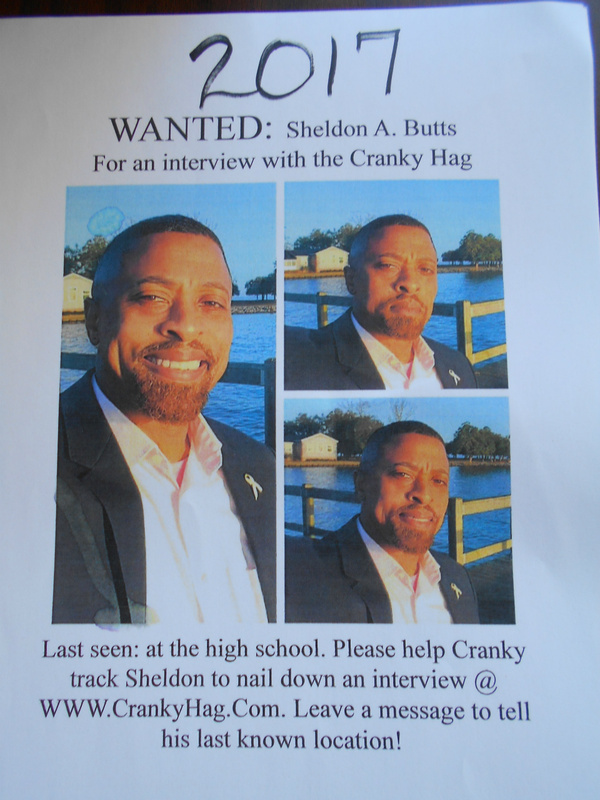 At present, Sheldon works as an educator at the high school. He teaches Non Diploma Tracked children at the high school level. I had asked once before what that was and he had answered, but now I could not remember at all so I asked again. As a man with ADHD, his 14-year military life helped to give him structure. He admitted that at the time, he didn’t realize he had that diagnosis because of the military routine. Although he was honorably discharged as a captain and a company commander, his life was forever changed from the experience. “Have you been in any wars?” I asked as I sat as his mother’s table. “You know you can become an alcoholic doing that, don’t you?” I teased. Knowing that Sheldon is a man who believes in God, I suggested he go through God to quit. “I no longer have any desire whatsoever to smoke again,” I stated of my own addiction. We spent a lot of time talking about his girlfriend, Rhonda Green, his military life, his teaching, his alcoholism and so much more. In speaking of our addictions, it raised a question on the current Facebook debate about whether these addictions are disease or conditions of choice. While I believe they are by choice, he is adamant they are caused from a disease process. “So you were a functional alcoholic?” I asked. “Hypothetically, what if I went and lay with someone and got an STD? I didn’t ask for that?” he rebutted. In the end, I understood what he meant. The disease of addiction is a process the mind takes on. You eat the bacon and cook in the bacon grease knowing it is a link to heart disease is an equivalent to you took a drink knowing it leads to addiction. The reason I had such a hard time nailing him down for an interview was because of Sheldon’s very active lifestyle. I knew everyone in town sees him about so the flyers went out to track him down. To list some of his commitments that extend past Rhonda, he also teaches varsity basketball and track, he is a trustee at Bethel A.M.E. Church, he is on city council, and Sheldon often volunteers a lot of his time doing public speaking when he’s able or asked to. In addition to these things, he is on the sub-committee for the West End Redevelopment Plan which has been sitting idly since 2003. He is passionate about wanting to see this revived. I firmly expressed to Sheldon that I wanted to see the old slave homes on Front Street refurbished. They are beautiful in their historical presence and need to be respected. I admit, the very first time I ever met Sheldon Butts, I thought to myself, he’s going to become president one day. I often tease him about that and tell him he and Rhonda would make a nice addition to the White House.